If you value content that is written clearly and concisely, effectively engaging with your audience, then you’re in the right place! At SpellCheck, we’re a waffle-free zone, dedicated to making every word count. Managing editor Deirdre O’Flynn has over 20 years’ experience providing premium copywriting, editing, and proofreading services. Our clients range from local authorities to individual authors, semi-state organisations to PhD and Masters’ students, small businesses to the community and voluntary sector. As an experienced copywriter, Deirdre keeps your voice at the heart of your content – and we deliver on time, every time and right first time. We specialise in reports, website content, newsletters, and features and you can hire our professional copywriting service or editing services to improve your content. Don’t be stuck for words! 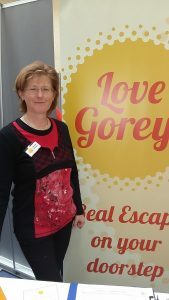 As well as being a top quality copywriter and experienced editor, Deirdre is the content queen at Love Gorey, a promotional campaign for Gorey and North Wexford supported by Gorey Municipal District and Gorey Chamber. She also trains business people to manage their own website content and has tutored in Internet marketing, social media, and in QQI modules including Communications, Customer Service, and Business English. She is also a member of the Kildare-Wicklow ETB External Authenticator panel. Deirdre has a Diploma in Rural Development, a BA in English and Sociology, and an MA in Journalism, and has added a QQI Level 6 Train the Trainer certificate and a QQI Level 6 certificate in Life Coaching (Professional Coaching Practice and Ethics) to her qualifications. She is a member of the NUJ, the Teaching Council, and Gorey Chamber. When she’s not reading for work, you’ll find her reading crime novels, walking, or trying to improve her photography skills!